Halesi is one of the mysterious places to visit. It lies in Khotang district. Halesi is the meeting point of Lord Buddha and Lord Shiv. They met each-other in this place. So, we can see both religious people in the Halesisthan cave, one side Budhist and another side Hindu. People believe that if we beg something to god in Halesi god hear and then it becomes true to their life. Halesi Mahadev Pilgrimage Tour is one of the most ancient and holiest places quite popular among pilgrims as the Pasupatinath temple in Kathmandu. The Temple is situated in the hilly region between two holy rivers Dudh Kosi to the right and Sunkosi to the left. Temple has preserved inside the small beautiful cave as well as there is another numerous beautiful cave scattering around. Because of the Natural Inheritance, everybody became spellbound while arrived at there. Halesi is one of the main temples of the Hindu people. This place is really mysterious, we can see the rocky mountain and big stone. Inside big stone, we can see different belief in different things such as, "Pap Duwar", "Dharma Duwar", "Karma Duwar" etc. In the entrance gate, there is Gumba of Buddhist, so it gives really contradict feelings to visitors. The place became famous for its historical, religious, culture and tourism importance. Probably the land has supposed gift of natural god because of three mysterious cave symbioses three eyes of God Shiva. After marching some steps down the stairs at the walls of the cliff there is a big red stone, which has worshipped as Gauri Parbati. Halesi Mahadev is regarded as the important pilgrimage destinations in Nepal. Inside the cave, we can see an amazing creation of god or amazing creation of nature, the shape of stones are a different kind of. In this cave, we can see flying pigeon and bats all around. 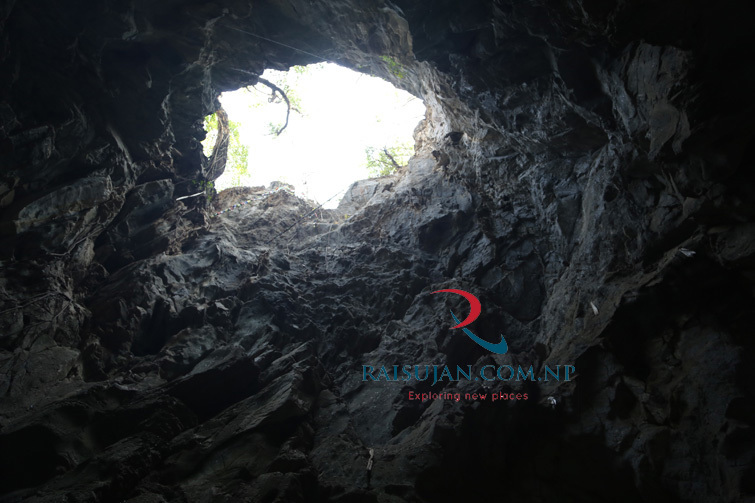 Another opposite side of the cave also has amazing factors, such as in the entering point we can see the waiting area of Vasmashur and there is a hole , inside hole when we walk forward we can see the mesmerizing scene of tree, stone and sky. Its really entice the visitors and there is historical quote that Vasmashur wants to under-pressure Shiv, but Shiv entered the cave and he escaped from another side so, this cave is made. If you want to go to visit Halesi, there is the route from Kathmandu its approximately 200km. There is facility of Hotel to live and buses are also available to travel to your destination. Come and visit make your trip memorable and unforgettable thank you. ©raisujan.com.np All Rights Reserved. Developed & Designed by Sujan Rai.